Prominent & Leading Exporter from Kolkata, we offer carbide tips. We manufacture 2000 different varieties of standard tips conforming to ISO (International Standard), BSS (British Standard), SMS (Swedish Standard) and DIN (German Standard). We have developed its Sintered Metal Cutting Grades conforming to ISO standards. Other than standard tips, We continuously try to develop custom-built special tips for various industries like Automobile, Engineering, Shoe Accessories, Textile, Sugar, etc. 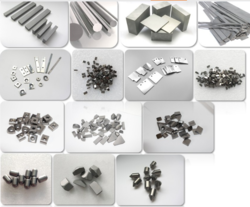 Some of the prominent products developed successfully are Blanks for Rotary Burrs, Tips for form tools, flats for knives, Scarfer tools, tips for grooving tools, rods for boring tools, slitting cutter blanks, etc. Each carbide tip is made to our own grade specifications and size tolerances, which have been developed through extensive research and trials conducted with some of the leading End users. Each tip must successfully pass two separate inspection procedures before it is acceptable to our customers. Looking for carbide tips ?